"It's not a holdout weapon, it's a pathfinder." The Fourth Horseman is a fully automatic Exotic Shotgun in Destiny introduced in The Dark Below. The Fourth Horseman is available in The Taken King, and is also available in Rise of Iron. "One look at The 4th Horseman, and the care taken in crafting it, points to the old trophy-driven traditions of the hunt, but this blunt force destroyer wasn’t built for just any game. Its precision tuning allows for full-auto firing, while measured impact timing provides an extra kick at the tail end of each magazine—a needed fail safe designed specifically for the weapon’s intended prey, the biggest game in the system, the Cabal." This weapon's signature ability is "Thunderer", which grants full auto-fire right of the bat without needing to upgrade the weapon. 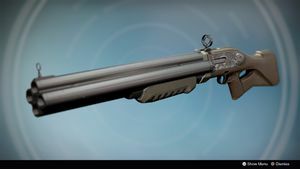 It is the fastest firing shotgun in the game, outpacing even Invective, which also is fully automatic. This blindingly fast fire rate allows the player to deal massive damage in a short period of time. However, its limited magazine of 5 rounds hinders its burst damage capabilities until it can later be upgraded with "Return to Sender", which allows kills to replenish ammo directly to its magazine. Combined with the low range and slow reload speed, this shotgun takes work to master. But, if the wielder is fast enough to rush into close range and unleash all 5 shots in rapid succession, then this weapon will take down enemies very quickly. Thunderer: This weapon can be fired in full auto mode. CQB Ballistics: Greatly reduced recoil. Significant penalty to range. Final Round: The last round in the magazine deals bonus damage. Speed Reload: Reload this weapon quickly. Fitted Stock: Increase weapon stability. Hand Loaded: This weapon is effective at an extended range. Return to Sender: Kills with this weapon have the chance to grant bonus ammo to the magazine. The Fourth Horseman was designed to quickly take down enemies at close range. If used correctly, it is capable of downing majors and more powerful enemies very fast. This weapon requires some skill to get used to the recoil pattern but once mastered, it can be used just about anywhere. In PVE, the weapon is great for dealing large amounts of close range damage in a short time, a useful trait against Major enemies. However, if you're not careful, you may wind up firing more shots than intended, leading to wasted ammo. The low stability can also cause shots to miss or only graze enemies, if you aren't close enough. In PVP, the full-auto trait can be a burden if you don't know what you're doing. Because you only have a limited amount of special ammo to begin, and the fact that getting more isn't always easy, conserving it is important. The aforementioned traits make for easy kills at close range, but can cause you to use up ammo too quickly, depriving you of a weapon until more special ammo can be gathered. This weapon was called "The 4th Horseman" prior to patch 1.2.0. This weapon is a reference to the Four Horsemen of the Apocalypse. Render of the Fourth Horseman.